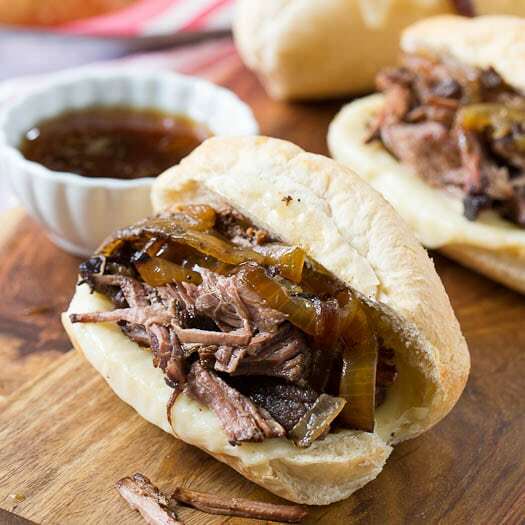 Tender and juicy Crock Pot French Dip Sandwiches make a fantastic meal for lunch or dinner. 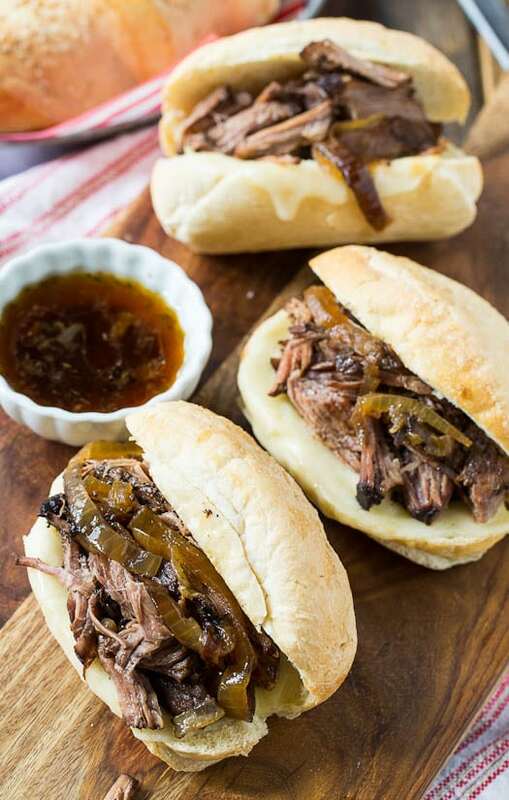 The meat is slow cooked for hours and then served on a toasted hoagie with melted provolone. Eat with a side of the salty cooking broth for dipping and you’ll think you’ve died and gone to heaven. I’ve been using my crock pot a couple times a week since fall started y’all. There’s just no easier way to make a meal. And food that has been slow cooked all day develops a flavor that’s hard to mimic. 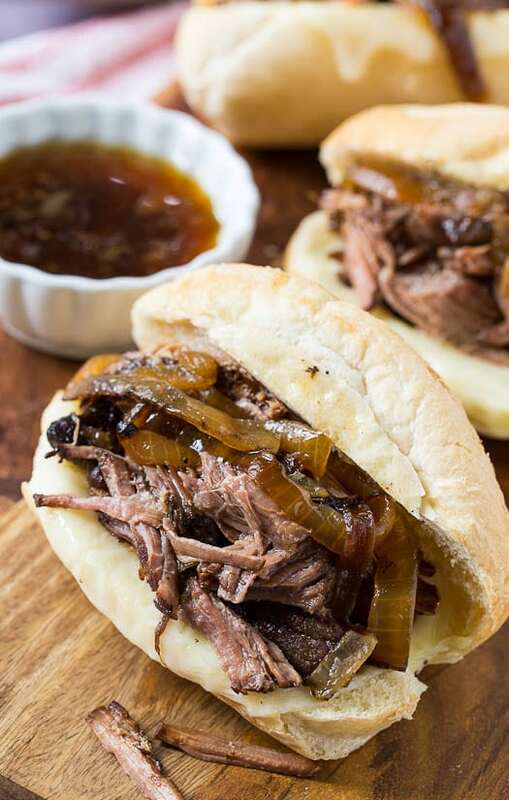 This Crock Pot French Dip Sandwich is one of my favorite slow cooker meals ever. It doesn’t hurt that it’s served on a toasty bun with melted cheese. It’s truly one of the most fabulous sandwiches ever. I had a chance to meet Cris of Recipes that Crock this past weekend. Talk about a sweet gal. If you’re ever short on crock pot inspiration, check out Recipes That Crock for tons of ideas. I think she’s cooked everything imaginable in a slow cooker. You can also follow my Crock Pot Pinterest Board for recipes. I pin crock pot recipes from tons of different blogs and websites. If you’re in the market for a new crock pot, check out the recommendations from Cris. She knows her crock pots. I’ll be in the market for a new one soon. I think I’ve had mine for going on 2 decades. I’m leaning towards the Hamilton Beach Stovetop Slow Cooker . It’s the kind that you can cook with on the stove top so you don’t have to dirty an extra pan if you have to sear something first. I know most people use their crock pot to cook during the day while they are at work, but I’m a night time cooker. I’d much rather be in the kitchen late at night than early in the morning. I’ll get everything in the crock pot before I go to bed and hopefully remember to turn it on. Have you had that happen too? This recipe does fine on LOW for 9-10 hours. Then in the morning, I transfer the contents of the crockpot to a bowl and refrigerate. Later, I reheat it for lunch or dinner. After 10 hours in the crockpot, the roast is unbelievably tender and succulent and so nicely flavored from the garlic, onion, thyme, and beef broth. If you like your French Dip broth really salty, add an extra tablespoon of Worcestershire sauce or even some soy sauce. Serve this fall apart meat on a toasted hoagie with a plentiful amount of melted provolone (you could also use Swiss or even Monterey Jack) and a side of cooking broth for dipping. You won’t believe the oohs and ahs you’ll hear. Tender and juicy meat cooked long and slow and served on a toasted hoagie with melted cheese. Dip in extra cooking broth for an out of this world sandwich. Heat oil in a large skillet over medium-high heat. Sprinkle roast with salt and pepper and cook until seared on both sides, about 3 minutes per side. Add onions to the skillet and cook until lightly browned, about 3 minutes. Add onions to crock pot along with remaining 1/2 teaspoon salt, beef broth, Worcestershire sauce, bay leaf, garlic and thyme. Cover and cook on LOW for 9-10 hours. Heat oven to 375 degrees. Cut rolls in half and line insides with cheese slices, using 2 slices per hoagie roll. Place on a baking sheet and bake for about 5 minutes, until cheese is nicely melted. Remove the meat from the crock pot and place in a bowl. Use a fork to shred it. To serve, stuff each hoagie with beef and onions and serve with cooking liquid. Sharing this recipe at The Country Cook’s Weekend Potluck. This entry was posted in Sandwiches and Wraps, Slow Cooker and tagged beef, crockpot recipes, slow cooker. Bookmark the permalink. Am I able to do this recipe in the Instapot? I’m still learning how to use mine but what I’ve made so far have been great. I would love to try this but in half the time. Any suggestions from anyone? More than a very great recipe!! God bless!! This looks so good, do you think I can make it in a dutch oven? If I cook this on high instead of low how long would it take? Hey what is the answer to this? I would like to do high for 6 hours. Is this possible? Also, should the meat be fully covered or should I be randomly putting spoon fulls of liquid on the top? I cooked 8 hours on high & it came out perfect. I also used on cam if beef consommé and 1 can of beef broth so it was fully covered. Can you cook this on high in the crock pot or does it have to be cooked on low? Just realized how long it takes and wanted to make it tonight but wouldn’t eat until 9pm! Yes, you can cook on HIGH. This was absolutely wonderful. I did it exactly as written except used top round. After 10 hr in crockpot it was tough. Transferred to my pressure cooker 27 mins. Sliced it omg delicious. Having it for company tomorrow but had to try it. So happy you enjoyed it Jana! Hope your company did too! This is definitely the kind of dinner my family LOVES. Perfect for summer! I have never made French Dip before. This was so easy and perfect. I just added bell peppers in as well. Thanks. Made this and it was amazing! 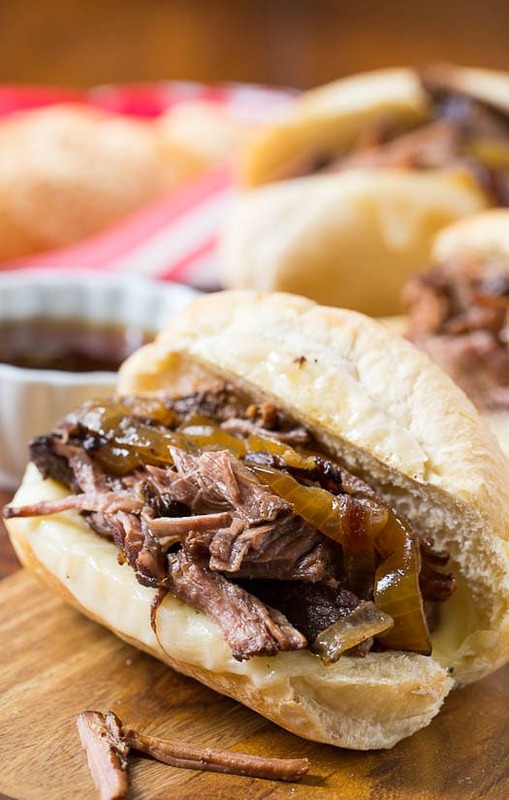 By far the best beef dip recipe I’ve used, and the fact its made in a slow cooker is an added bonus. Thank you for sharing this recipe! I cook for a picky eater, and this is something he actually likes. Thank you for the recipe!! Very good!! I will pin to my frequently used recipes! Chips, cole slaw, and pickles finished it off. So glad you liked it Vicky! I have this in the crockpot right now, and the aroma is heavenly! If it tastes as good as it smells, I’ve got a winner! I’ll be back later with the results. I made these today. I did add extra Worcestershire sauce to the au jus. I also added in thick cut mushrooms in the beginning for a little added “meat” It was delish!! I used a boneless bottom roast (not as greasy) and this was delicious. Probably will add an additional tablespoon of Worcestershire sauce as suggested for us salt lovers next time. I tried this recipe yesterday for having people over to watch the playoffs. FANTASTIC! Such an easy and flavorful mix. This will definitely be replacing my usual pulled-pork in the Crock Pot for a while. The only difference between this recipe and my finished product were the onions. They melted away. I even added two more halfway through. But I dare not complain, I know it just added to the overall flavor. GREAT RECIPE!!!!!!!! The photos are amazing! I am drooling. LOVE crock-pot recipes. Can’t wait to try this one. These look delicious! I love the idea of cooking them overnight – I’ve got to try that next time! Oh my gosh. These FD sammies look about 10x better than any restaurant’s! Totally loving that it’s slow-cooker and your photos are absolutely gorgeous, Christin! Pinned. I’ve been using my crockpot a ton over the last few weeks too! I use it all year round but definitely more than anything during the fall / winter! This sounds delicious! And I really should try using it overnight … I don’t know why I never really think to do that! mmmm…tasty, tasty! French dip sandwich is one of the best. This is such a great idea. I need to try this one! 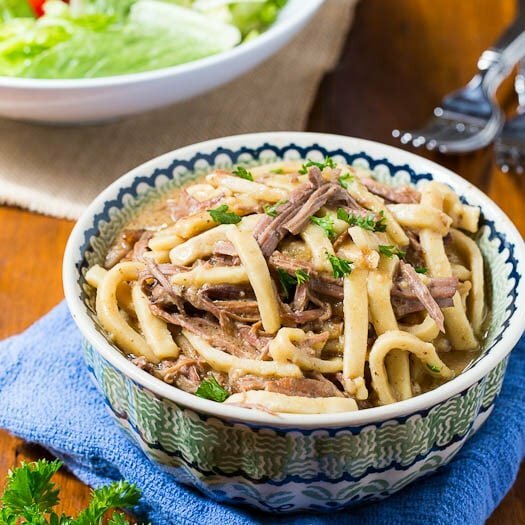 Crockpot recipes are just the best, especially during this time of year. 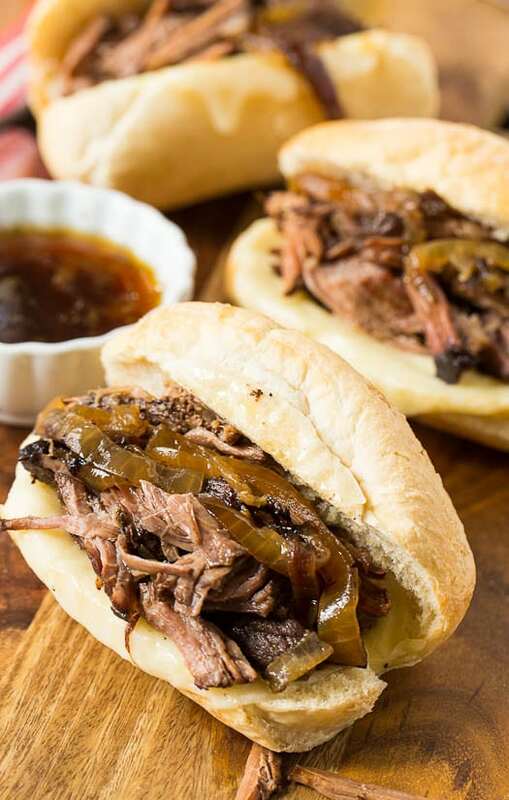 I love French dip sandwiches, I need to try my hand at them with this recipe now! Well done! Looks mighty tasty. Looks mouthwateringly good – I need to do this later this week. I’ve heard a lot about these sandwiches, but I have never had one. Going to have to try it as these look amazing. This sandwich looks right up my alley, loving all the amazing flavours! That looks amazing! I love using a crock pot, makes life so much easier. I will definitely have to try this recipe! I love using my crock pot year round, but it’s especially nice in the fall and winter. This french dip looks amazing! I haven’t tried this out before, so I definitely need to change that. Pinned!